I think this might be the only station on the Underground that has stained glass (though I’m more than happy to be proved wrong). They were created by the Hungarian artist Ervin Bossányi, who emigrated to the UK in 1934: just four years before Uxbridge station was rebuilt in its present form to a design by Charles Holden. During a hugely successful career in this country Bossányi would make stained glass for, among others, the University of London, the Victoria and Albert Museum and York Minster. 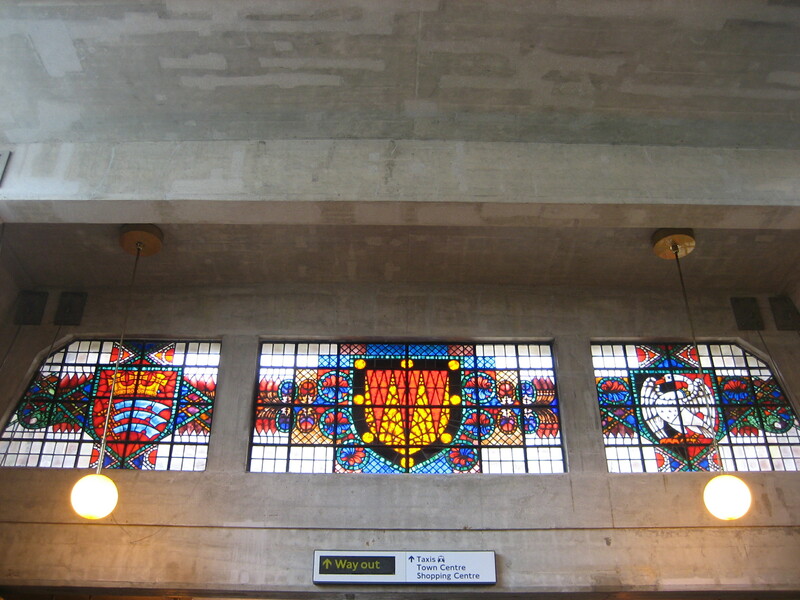 But the three designs he produced for Holden must count statistically as his most viewed – and perhaps simultaneously, like Oliver Hill’s bus station at Newbury Park and Eric Aumonier’s archer at East Finchley, his most under-appreciated, by virtue of their home being not an imperious seat of learning or popular tourist attraction but an ordinary railway terminus. Of course I would argue that Uxbridge is anything but ordinary, and I’ll return to rave about some of its other stunning features another time. For now I’ll merely sing the praises of this trio of handsome gems, which depict, from left to right: the arms of the old Middlesex County Council, an institution abolished by Tory minister Keith Joseph in the early 1960s; the arms of the Basset family, esteemed local landowners of centuries’ standing; and a historic emblem of Buckinghamshire. And were there ever need for a more contemporary representation, may I suggest something to do with Press Gang, which was filmed in Uxbridge and which remains the finest children’s TV drama series ever made. I have never seen Press Gang. I can’t remember – but then U B is remarkable for something else in tiles/tessellation! 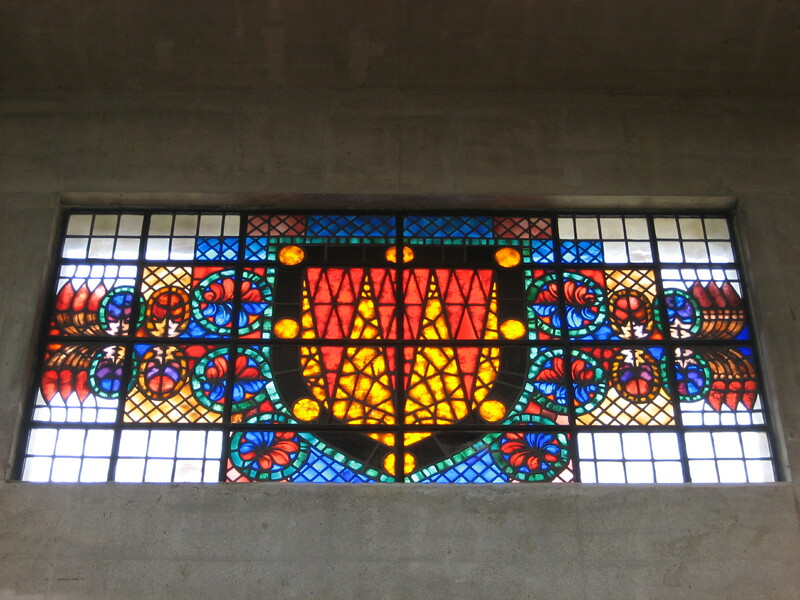 I am lucky enough to live in Uxbridge and to travel frequently from this fab station; the Dad of a friend I went to school with actually fabricated this window for Bossanyi. He (the friend’s Dad) worked, as head of the glazing department, for a thriving local building firm called Kirby Brothers. My deepest regret about the station is that London Transport recently installed a hideous suspended steel system carrying CCTV and speakers the length of the train shed and the ticket hall (many tonnes of steel to hang a few cameras and speakers) – even Holden’s strong and rugged architecture struggles against this monstrous installation. Keith Joseph, philistine that he was, may have been able to abolish the Middlesex County Council but neither he, nor anybody else can abolish the County of Middlesex. Its name lives on in many ways including in that of its cricket team.